The Induction ceremony which held at Amphitheater kicked off with the National and great ife Anthem. The ceremony had Professor Eyitope Ogunbodede(Vice Chancellor), Professor Kayode Ijadunola(the Provost, College of Health Sciences),the Chief Medical Director(CMD) of the Teaching Hospital Complex represented by the Chairman Medical Advisory Committee (CMAC) and other dignitaries in attendance..
Students at the University of Lagos, University of Nigeria, Nsukka and Obafemi Awolowo University, have emerged tops in the just-concluded Bar Finals Examination. This was contained in the analysis of performance by universities in the August 2017 Bar final examination results of the Nigerian Law School. While six students at the UNILAG emerged with First Class honours, four emerged from UNN and three from OAU. Two students each also emerged with first class grade from the universities of Ibadan, Uyo, Lagos State University, Osun State University, and Babcock University. University of Ilorin, Igbinedion University, Ambrose Alli University, Afe Babalola University, and Adekunle Ajasin University also have a student each graduating with first class. Out of the 515 foreign students that participated in the examination, none graduated with a first class, 134 failed and 275 passed. This is to inform the aspirants of the Obafemi Awolowo University that the merit list for the 2017/2018 admissions has been released.. This is to inform the great ife community that the registration for the 2016/2017 convocation ceremony of Obafemi Awolowo University has been opened for graduates of the event. All payments are to be done online... Note that the list of the graduates approved by the university senate has been uploaded on the portal. The postponement,according to the board was due to the delay in meeting agreed deadline by the publisher of the compulsory reading text meant for prospective candidates for the 2018 UTME. 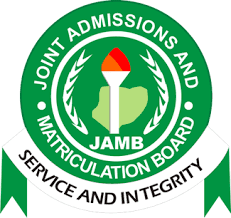 JAMB, in a statement by its Head of Media, Dr Fabian Benjamin, said the ” publisher had promised to deliver all the texts for the 2018 candidates on or before the 7th of November, 2017. It regretted “all inconveniences occasioned by this postponement”, saying it was working round the clock to announce a new date soon. For the 9th straight year, Beyond Ife is hosting her annual entrepreneurship , career and training event on OAU campus. Beyond Ife is the biggest and foremost marketplace readiness training in O.A.U and across Nigeria, where mainstream entrepreneurs and business personalities gather to share their wealth of knowledge with students . This year’s edition holding at Oduduwa Hall, Obafemi Awolowo University, is the biggest yet and if you have even the slightest interest in Nigerian business, career and entrepreneurship , you wouldn't want to miss it. From Alex Goma, Olufunmilola Bucknor, to Adeolu Akinyemi and host of many other. The variety of the panelists is sure to deliver an enlightening mix of ideas to land you first hit in life. The Society of Petroleum Engineers of the Obafemi Awolowo University, Ile-ife is set to hold her annual week. The week which is going hold between 4th December to 8th December 2017 would be featuring a number of fascinating programs. Find full details of week below. - Registration of new members and renewal of membership for old members. Christmas Cantata is an annual program organised by CEDAR GENERATION GOSPEL OUTREACH. It's such a program which heralds the Yuletide season.This year's edition comes up on the 2nd of December,2017. Venue: Cedarland Asherifa ola-estate, Old Ife-Ibadan road, Ile-ife. Time: 3pm, Red carpet starts by 2pm. A mighty and amusing 2 days conference that succours soaring higher in the digital world. * Brand vision and strategic. And also digital communication and its role in the context of businesses strategy and brand planning. "Your brand is what people say about you when you are not in the room"
Venue: Ajose LT, obafemi awolowo university. Tickets available at Syntax, A&G (Thrillhouse) and 5ivers, Shekinna SUB, Or call 08134057106 to Order. 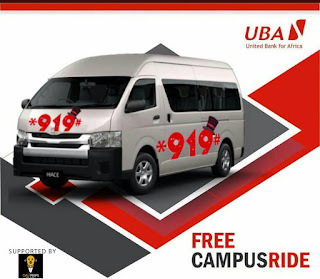 The United Bank for Africa (UBA) is set to give OAU Students Free Campus Ride. The UBA Campus Ride which is a Corporate Social Responsibility (CSR) Initiative @UBAGroup for Students in selected Institution of Higher Learning. 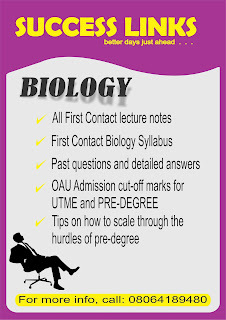 The Free Campus Ride which has been held in other universities like LASU,UNN,EKPOMA,UNEC,BUK etc. has Obafemi Awolowo University as their next target of the group so as to help students and give back to the society.. The Free Campus Ride will last five weeks in which Students don’t have to spend a dime to get to their destination around campus again.. Speaking with OAU Peeps News Agency, the UBA Campus Champs ascertained that students do not have to open a UBA account to access the UBA Campus Ride stressing that it's free for all..
A high powered delegation from the Nigerian Air Force (NAF) has paid avisit to the Vice-Chancellor, Professor Eyitope Ogunbodede to fine-tune and deepen the existing Memorandum of Understanding(MoU) on capacity building between the NAF and the University, as well as collaboration with the University in other mutually beneficial areas. 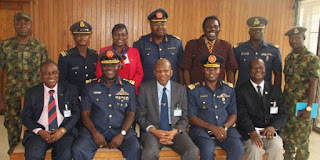 In his welcome remarks, Professor Ogunbodede, while receiving the team led by Air Vice Marshal Kingsley Lar,Chief of Standard and Evaluation, NAF, Headquarters, expressed delight at the confidence reposed in the University by the NAF, and commended the Forcefor coming up with the innovative idea. The VC while pledging his administration’s commitment to the full implementation to the (MoU) between the University and the NAF, conceded that OAU has done little to fulfil its own part of the MoU, and therefore promised a renewed focus on the agreement. In any historical documentation, one major highlight of the social media, especially in Nigeria, must certainly be memes. The art of fusing a picture with witty words in such a fashion that makes it difficult to not smile at its sight has become so sacred that it now forms a major highlight of social media communication. However comparatively, the art does not come with a lot of financial remunerative benefits yet. Hopefully, it would soon enough, who knows? Maybe Odunlade Adekola might finally make that list of the top richest artists in the country. However, apart from the Yoruba actor, another class of people that often suffer the wrath of these memes are the Ibadan people. Due to the peculiarity of their pronunciations of English words, which is of course often an aftermath of some adaptations of the elements of the local dialect. Some of such instances include the pronunciation of the “sh”, “z” and similar sounds as “s” and “v” as “f”. 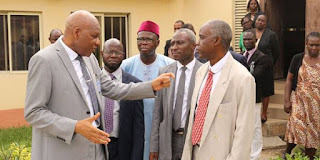 The Centre for Distance Learning (CDL), Moro, has played host to the Management team of the University, led by the Vice-Chancellor, Professor Eyitope Ogunbodede, visiting the campus in official capacity for the first time since assuming duty. An elated and apparently impressed Professor Ogunbodede , while addressing the generality of the staff of the CDL at an interactive forum after the three (3) hour campus-wide facility tour, commended the staff for their rather palpable commitment to the progress of the CDL, charging them not to relent in the good works which according to him are worthy of emulation. The Vice-Chancellor who affirmed that the CDL is not under any threat whatsoever as it has been doing well financially, appealed to the staff to moderate their agitations for the payment of some allowances paid on the main campus, noting that the Board of the CDL will look into their request to see what can be legitimately accommodated, without being rail-roaded. Graduating students of the Obafemi Awolowo University Ile-Ife, Osun State are all set for the annual career and entrepreneurship event - Beyond Ife. The event, which is scheduled to hold on the 25th Day of November 2017,would receive mainstream entrepreneurs from across raging profession in the country, including ; Alex Goma, MD PZ Cusson, Olufunmilola Bucknor, Talent manager, Samsung West Africa; Aramide Abe, founder, NaijaStartUp among others. Beyond Ife is a career training and entrepreneur seminar. A sessional programme that comes up every second semester with the sole aim of preparing students for marketplace excellence. Unemployment and underemployment are two big issues today in Nigeria. Unemployment is currently on the rise at 14.2% and underemployment at 21%. Underlining this reality is the poor quality of graduates, the country produce year on year rendering them unemployable. In other words, Nigeria graduates lack certain requisite skills needed for sustainable employment. At the maiden edition of the Nigerian Universities Merit Awards which held on Saturday, 19th November 2017, OAU Peeps News Agency emerged as winner of the Best Nigerian Varsity Editorial category. The agency which was nominated alongside other organisations from other Universities was announced winner of the category after losing to the Campus Anchor Agency in the Best Media Organization category. Boluwajaiye Adeoluwa (Fynestboy) who won the best online personality.